The inaugural The Big Weekend multi-band event will span five venues in Chicago between October 4 – 6. 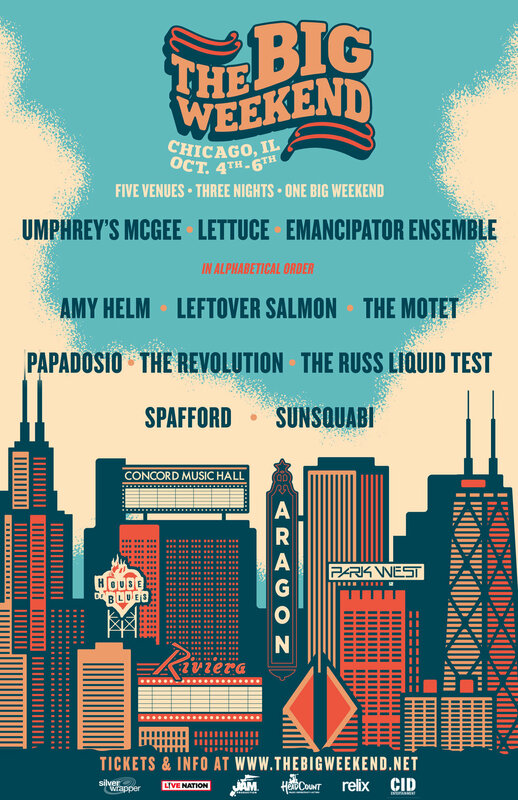 Umphrey’s McGee, Lettuce, Emancipator Ensemble, Amy Helm, Leftover Salmon, The Motet, Papadosio, The Revolution, The Russ Liquid Test, Spafford and Sunsquabi will each perform as part of The Big Weekend 2018. Lettuce kicks off the action at the Concord Music Hall on Thursday, October 4. Early shows scheduled for Friday, October 5 are Emancipator Ensemble with Papadosio at The Riviera Theatre, The Revolution at Park West and Spafford at the House Of Blues. In addition, The Motet will be joined by “special guests” for a late night concert at Concord Music Hall on Friday night. Tickets for all shows as well as VIP options and travel packages go on sale this Friday, June 8 at 10 a.m. CT. Big Weekend VIP Experiences and travel packages will be available via CID Entertainment. Organizers of the event will donate $1 from each ticket sold to HeadCount. Head to TheBigWeekend.net for additional details.